Have a Drink at the Monterey Wine & Beer Festivals! Do you enjoy your libations? If you’re staying in hotels in Monterey CA this June, be sure to check out the Monterey Wine & Beer Festivals! This year, both events are happening on the same weekend, so there is plenty to enjoy! The 36th Monterey Wine Festival is June 8-9 and the Monterey Beer Festival is one day only, June 9. On June 8th, “A Night to Celebrate Reds” will be held at the Custom House Plaza at Monterey State Historic Park. Prepare to meet other wine and dining enthusiasts and industry professionals who will gather to sip the finest. 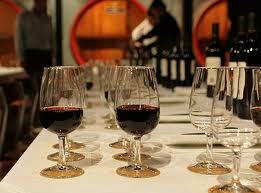 Guest will discover new wines and have the opportunity to discuss attributes with the experts. International cheeses and other bites will be served along with wine. VIP Tasting is from 5pm to 9pm for $75, limited to 300 guests. General admission tickets are $50 for 6pm to 9pm. On June 9, come back for the Bartender’s Fedora Cocktail Throw Down at 2pm. Professional bartenders will compete to come up with a drink using a spirit from a sponsoring distillery. Prize is a selection of fine spirits for your our private bar and $200 in cash. The West Coast Chowder Competition will return this year with the best in white wines and chowders. For the 3rd year, local restaurants will compete for the coveted Copper Pot Award and cash prizes. Guests will be able to choose the People’s Choice Award chowder. Tickets are $35 including beer, wine, chowders, spirits and more. Chowder sampling is only $10. If wine doesn’t tickle your fancy, come over to the Monterey Fairgrounds for the 2012 Monterey Beer Festival. Beer from all over Europe, Asia and North America will be served. VIP hours are 11:30am to 12:30pm, with snack meats, cheese, crackers, chips, pretzels and nuts. VIP tickets are $60. The main event hours are 12:30pm to 5pm, at $40 a ticket. "Tribute to Rock" bands will perform live at festival, emulating AC/DC, U2 and the Heart Breakers. Whichever event you choose to attend, this is sure to be an awesome weekend in Monterey!